Due to the nature of laboratory vacuum pumps, there’s no one pump that will suit every set of circumstances. There is a lot of choice available when searching for a laboratory vacuum pump, so it can be useful to create a shortlist of potential models. When searching for a laboratory vacuum pump, don’t assume that the most expensive will be always the most reliable, as this isn’t always the case. As such, you should try to establish a budget so you know what vacuum pumps can be considered. The price of a pump will not always be attributed to its performance, but the services it’s able to offer. Ensuring you use a reputable supplier of laboratory vacuum pumps will ensure that regardless of your budget, you will be able to source a laboratory vacuum pump that can meet your requirements. What Kind of Depth Is Needed? Different laboratories will have different procedures in place when it comes to working practices, and the type of vacuum pump that needs to be used can vary depending on the role being carried out. For example, operations such as liquid aspiration and vacuum filtration will rely on the differentials of pressure, meaning that only a small vacuum is needed. The Rocker 300 offers 106 mBar is the ideal vacuum pump for these operations, and while being an affordable unit, it doesn’t skimp on the additional extras, such as thermal protection and moisture trap. Those working on operations that involve evaporative applications will require almost double the vacuum, as the pump will be able to vapour pressure. Different solvents will often mean that there is some variation as to what level of vacuum is used. Will You Be Dealing with Corrosive Materials? Another important factor that needs to be considered is the type of materials you will be using. Although using the right supplier will ensure you’re only using a reliable model, it’s still important to ensure that you’re purchasing a vacuum pump that’s fit for purpose. Investing in a laboratory vacuum pump that is exclusively designed for corrosive material may be more expensive than a conventional pump, but it will be more cost-effective in the long term. What Type of Environments will The Vacuum Pump Be Used In? It’s not only the materials being used that need to be taken into consideration, but also the environment where you will be using the vacuum pump. Different operations mean that some vacuum pumps may need to work in colder and adverse conditions. There will be vacuum pumps available that work in several types of environment of varying temperatures, while others may be more restricted. As such, it’s important to factor in what type of operations will be going ahead, and what environments will be used to carry out these operations. It is also resistant to corrosion making it perfect for those looking for a pump that can be used in a variety of conditions. The Vector LT-9 has a Teflon coating on the most vital components, which makes it ideal for those looking for laboratory vacuum pump that can be used in adverse weather conditions. Have You Factored in Power Failures? Depending on where you’re based, power failures can be frequent or non-existent, but in either event, it makes sense to ensure that there is some way of preserving work should the worst-case scenario occur. Ensuring that you have an Automatic System Isolation (ASI) ensures that should anything go wrong, those carrying out lab operations will be able to safeguard their process. It can be useful to ascertain as to whether you will need to purchase an additional pump, as there could be savings to be made depending on the requirements. For example, should your requirements be available via two separate vacuum pumps, then you may save more money as opposed to only realising later on. It can take some time to research what type of vacuum pump suits yours needs best but ensuring that you’re only using trusted sources can make the search a lot more easier. This may seem obvious, but it can be easy to overlook the smaller details when trying to find a great deal. The importance of using a reputable supplier is reinforced, as there can be ramifications of using products that have no reputation within the sector. In some instances, companies will look to capitalise in the success of a sector with cheaper, albeit inferior, vacuum pumps. These vacuum pumps can seem appealing because of their cheap price but using the wrong type of pump will just mean investing more in replacement pumps. At best, the pump could just become defective. At worst, a vacuum pump that doesn’t meet safety standards poses a threat to all those using the device. 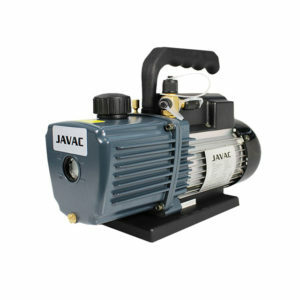 Using a reputable supplier of vacuum pump such as HVACTOOLS will ensure that you’re paying the best price, without having to run the risk of your safety. All models are tested and only sourced from reputable manufacturers within the industry, so you can be confident of great value in every respect.